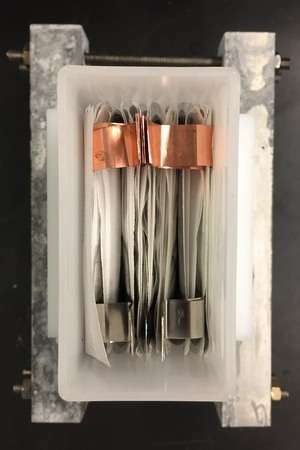 A new generation of manganese dioxide-zinc batteries with unprecedented cycle life and energy density is the latest innovation at The City College of New York-based CUNY Energy Institute. The discovery has made the common household battery suitable for large grid storage applications. City College Senior Research Associate Gautam G. Yadav and his team applied a new twist to the old chemistry behind batteries. The result is a battery that takes advantage of intercalation and complexation chemistry to make the cathodes rechargeable to a larger extent, greatly extending its life. "A new layered crystal structure of manganese dioxide is used in this chemistry, which is intercalated with copper ions. This makes it rechargeable to its theoretical capacity for a significant number of cycles," said Yadav. According to Yadav, this is the first time a novel calcium hydroxide interlayer is used to block the poisonous zinc ions through complexation. This in turn allows the battery to maintain its high energy density over 900 cycles. A recent trend in the energy storage field has been to replace unsafe and expensive lithium-ion batteries with zinc-anode versions as zinc is cheap, abundant and much safer. Until now, the only detriment of this version has been the latter's relatively short cycle life, which has not allowed it to be successfully commercialized as a rechargeable battery. The Yadav team's research appears in the Journal of Materials Chemistry A. What is a "large grid storage application?" I wonder if these will leak zinc chloride everywhere like the common zinc carbon batteries. I very much have my doubts but supercapacitors seem to be gaining ground quite rapidly. Not trying to be rude - honest - but your question really surprises me. Cost effective grid storage is the holy grail of renewable energy. Wind/solar are intermittent, and cannot be controlled in the way a fossil fuel power plant can. If demand does not match supply - we have a problem. This problem can be mitigated using techniques such as demand control (smart meters), and transmission (piping the power around to areas of the country/world where there is demand). These techniques only work up to a certain point. If you had a solar plant - with a big hunking battery next to it - when you had excess power - you could store it, and when you had excess demand - you could draw it down. Obviously this adds to the cost of the system. The cheaper the overall cost of the storage - the more viable renewables become. A huge race is on right now - to find cheap storage options. huge race is on right now - to find cheap storage options. I agree with you about at least part of it. Fusion will be the power source for big time applications. But battery technology is still in a race. We need battery technology to power all those devices that can't use a extension cord. Robots and exosuits are the biggest example I can think of. Perhaps fusion reactors could power a car or plane but I doubt they will be small enough to power our personal devices.